About the deck. This deck is made from exotic woods from Italy. 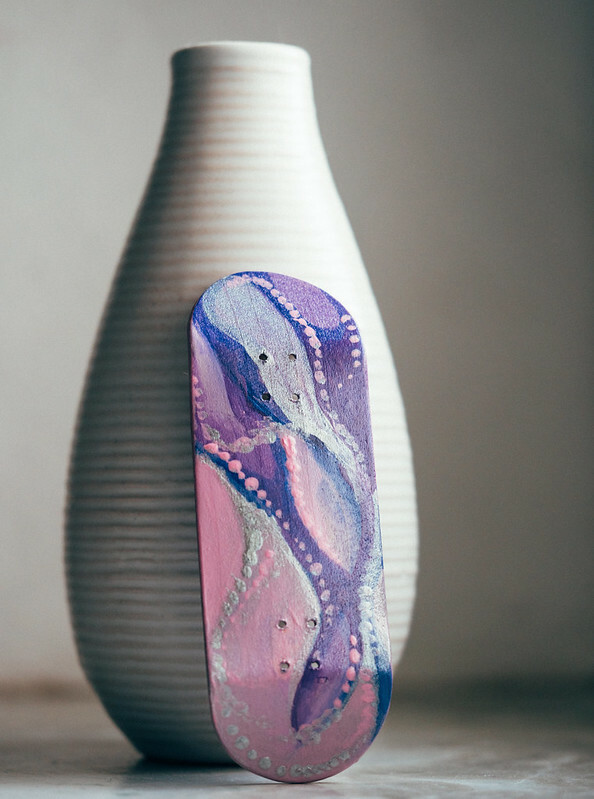 The bottom ply is handpainted with several cvolors. It combines straight silver with purple tones. It totally reminds my on mermaids, I really don´t know why, but I´m not the biggest art dude out there. On this deck Sebastiano worked together with his mother. He made the deck and his mother paint them. Why? 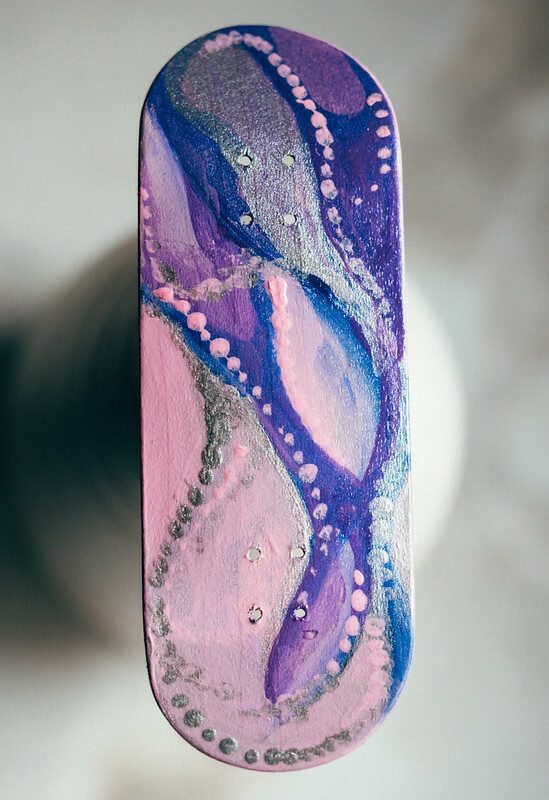 Sebastianos mother is a painter and makes – besides art on fingerboards – real paintings. 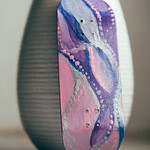 So it makes sense, that Sebastianos mom paints the decks. The colors are overall strong and I think it will look even beter after some slides when the colors mix together and you got that “real” slide look. Paint will work for this even better than a real wear graphic. The deck is about 34mm wide and the countersinks are deep, straight and clean. Nose and tail of this deck has a normal popsicle shape. The shape is all over medium and it is pressed clean. Nothing warped and the sanding-job is fine. 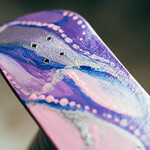 This is “just” a solid, good, clean, up to date fingerboard and this time with some art on it. 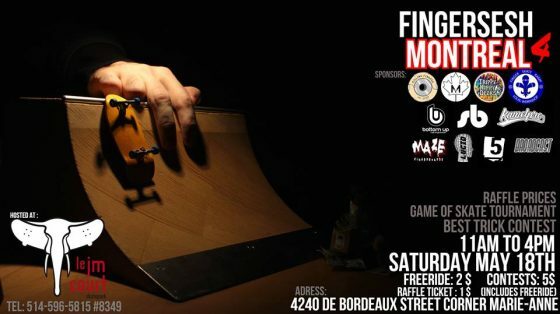 “Pushing the scene foward” is the aim of Italian Fingerboards. Sebastiano offers normal blank decks for only 14,90 € and art-series decks for 29,90 € including shippment (worldwide), stickers and a sheet of tape. 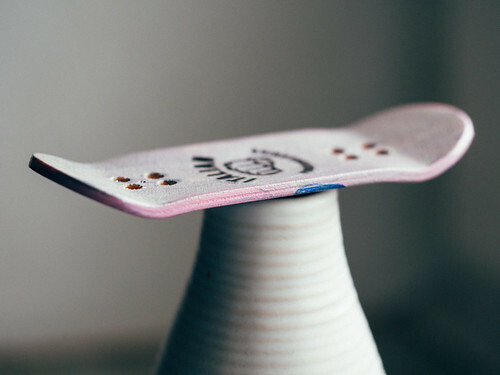 The only way to order such a nice Italian fingerboard deck is a DM on Instagram. 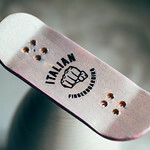 Just contact Sebastiano right over here: @italian_fingerboarding The art-series decks are allways one of a kind decks. So if these are sold you won´t get them again. THX a lot Sebastiano for you patience and these nice fingerboard decks! Can´t wait whats dropping next!